August has been a exceptionally quiet month for gaming with not much to talk about in general. One of the talking points is the new Operating System for the Xbox One family. Currently only going out to a selected few Insiders who have been able to make their way deep into the realms of the elite Alpha Ring were allowed to download the latest iteration of the OS which boast a quite significant change in the look and feel compared to the current one we all currently use. 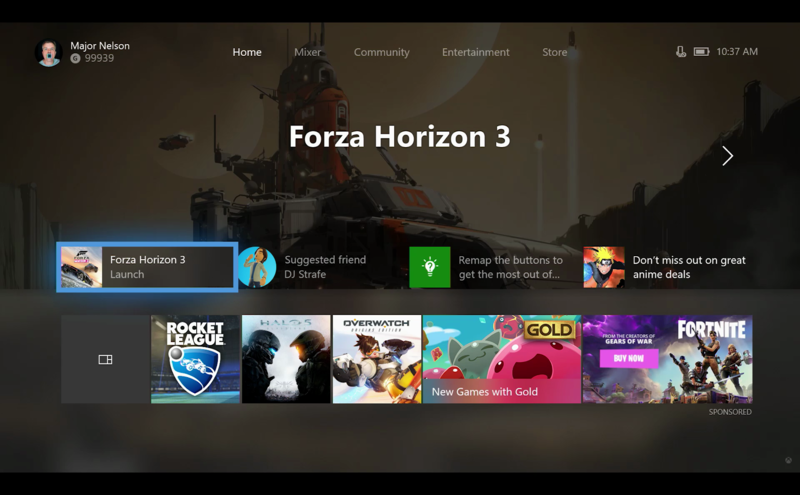 The first thing that users will notice when firing up there freshly updated console will be the new Home screen. This new design is part of a design that Microsoft is calling the fluent design. The design is focused around speed customization and expression. Microsoft has taken the best of all the previous versions and the best aspects thereof and has added and improved them all which has led us to this. Your tiles and pins and everything will evolve and change along with what you do. Playing more Forza Horizon 3 lately? Your tiles and pins will show more Forza content. From your friends who also play Forza and their screenshots or captured clips, to activity feeds from major figures in the Forza community. Another awesome feature is the removal of the screens you flip through when moving from home, social, and my games and apps. This means easier access and less waiting which in turn means speed and fluidity which makes us all happy! Getting connected with clubs and friends have been dramatically improved. The entire activity feed has been revamped to show more content at a glance. When you take a closer look the items and images will be displayed in glorious full screen mode. Comment are easier to read with the new full screen comment section. Game Hubs, Profiles and Clubs have been revamped to make them more dynamic and engaging. Currently the only title to be found in the Arena section is Killer Instinct, this will be changing as well and Arena will soon bolster a large array of titles to get everyone in the competitive spirit a shot at the glory. Game Bars, Game Bars everywhere! In the past enabling and disabling the Game-mode feature was a serious mission, you had to turn it on and off for individual games, not anymore! With the new Game bar coming to the PC, the game mode button will be right there on the game bar easy to see, easy to access. Using mixer, the game bar will give you a ton of extra features. It will give you options to broadcast game-only audio, or system wide audio. For the days that you might have some networking problems the kind people at Microsoft have decided to include a Xbox Live network Troubleshooter options to the settings menu right there in the Windows 10 setting menu which means you can sort out your issues quicker and get back to what you really want to do, GAMING! Microsoft has promised to listen to the community and they are doing just that. They have a top notch insider program that is open to anyone where you can sign up to try out the early versions of the updates before they launch to the public. This is where feedback is given from all the insiders in terms of what needs to change, improve or removed. Go and check out the Insider Program and become part of making Microsoft and Xbox great! appreciate the comment AJ we try our best to bring you, the community member, the latest and greatest. thanks for the support!